The five Olympic rings were designed in 1913, adopted in 1914 and debuted at the Games at Antwerp, 1920. The Olympic Games (often referred to simply as The Olympics or The Games) is an international multi-sport event subdivided into summer and winter sporting events. The summer and winter games are each held every four years (an Olympiad). Until 1992, they were held in the same year. Since then, they have been celebrated two years apart. The original Olympic Games ( Greek: Ολυμπιακοί Αγώνες; Olympiakoi Agones) began in 776 BC, in Olympia, Greece, and were celebrated until 393 AD. In 1896, the ancient Olympic Games were revived at the initiative of a French nobleman, Pierre Frédy, Baron de Coubertin, thus beginning the era of the Modern Olympic Games. Since the first modern games, in Athens, Greece, participation in the Olympic Games has increased to include athletes from nearly all nations worldwide. With the improvement of satellite communications and global telecasts of the events, the Olympics are consistently gaining supporters. The most recent Summer Olympics were the 2004 Games in Athens and the most recent Winter Olympics were the 2006 Games in Turin. The upcoming games in Beijing are planned to comprise 302 events in 28 sports. As of 2006, the Winter Olympics were competed in 84 events in 7 sports. Athletes trained in this Olympia facility in its ancient heyday. There are many myths and legends surrounding the origin of the ancient Olympic Games. The most popular legend describes that Heracles was the creator of the Olympic Games, and built the Olympic stadium and surrounding buildings as an honour to his father Zeus, after completing his 12 labors. According to that legend he walked in a straight line for 400 strides and called this distance a "stadion" (Greek: "Στάδιον")- (Roman: "stadium") (Modern English: "Stage") that later also became a distance calculation unit. This is also why a modern stadium is 400 meters in circumference length (1 stadium = 400 m). Another myth associates the first Games with the ancient Greek concept of ἐκεχειρία (ekecheiria) or Olympic Truce. The date of the Games' inception based on the count of years in Olympiads is reconstructed as 776 BC, although scholars' opinions diverge between dates as early as 884 BC and as late as 704 BC. From then on, the Games quickly became much more important throughout ancient Greece, reaching their zenith in the sixth and fifth centuries BC. The Olympics were of fundamental religious importance, contests alternating with sacrifices and ceremonies honouring both Zeus (whose colossal statue stood at Olympia), and Pelops, divine hero and mythical king of Olympia famous for his legendary chariot race, in whose honour the games were held. The number of events increased to twenty, and the celebration was spread over several days. Winners of the events were greatly admired and were immortalised in poems and statues. The Games were held every four years, and the period between two celebrations became known as an ' Olympiad'. The Greeks used Olympiads as one of their methods to count years. The most famous Olympic athlete lived in these times: the sixth century BC wrestler Milo of Croton is the only athlete in history to win a victory in six Olympics. The Games gradually declined in importance as the Romans gained power in Greece. When Christianity became the official religion of the Roman Empire, the Olympic Games were seen as a pagan festival and in discord with Christian ethics, and in 393 AD the emperor Theodosius I outlawed the Olympics, ending a thousand-year tradition. During the ancient times normally only young men could participate. Competitors were usually naked, not only as the weather was appropriate but also as the festival was meant to be, in part, a celebration of the achievements of the human body. Upon winning the games, the victor would have not only the prestige of being in first place but would also be presented with a crown of olive leaves. The olive branch is a sign of hope and peace. Even though the bearing of a torch formed an integral aspect of Greek ceremonies, the ancient Olympic Games did not include it, nor was there a symbol formed by interconnecting rings. These Olympic symbols were introduced as part of the modern Olympic Games. In the early seventeenth century, an "Olympick Games" sports festival was run for several years at Chipping Campden in the English Cotswolds, and the present day local Cotswold Games trace their origin to this festival. In 1850, an "Olympian" sports festival was begun at Much Wenlock in Shropshire, England, which also continues to this day as the Wenlock Olympian Society Annual Games. Later, similar events were organised in France and Greece, but these were all small-scale and certainly not international. 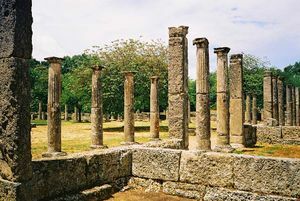 The interest in reviving the Olympics as an international event grew when the ruins of ancient Olympia were uncovered by German archaeologists in the mid-nineteenth century. At the same time, Pierre de Coubertin was searching for a reason for the French defeat in the Franco-Prussian War (1870–1871). He thought the reason was that the French had not received proper physical education, and sought to improve this. Coubertin also sought a way to bring nations closer together, to have the youth of the world compete in sports, rather than fight in war. In 1890 he attended a festival of the Wenlock Olympian Society, and decided that the recovery of the Olympic Games would achieve both of his goals. In a congress at the Sorbonne University, in Paris, France, held from June 16 to June 23, 1894 he presented his ideas to an international audience. On the last day of the congress, it was decided that the first modern Olympic Games would take place in 1896 in Athens, in the country of their birth. To organise the Games, the International Olympic Committee (IOC) was established, with the Greek Demetrius Vikelas as its first president. The total number of athletes at the the first modern Olympic Games, less than 250, seems small by modern standards, but the games were the largest international sports event ever held until that time. The Greek officials and public were also very enthusiastic, and they even proposed to have the monopoly of organizing the Olympics. The IOC decided differently, however, and the second Olympic Games took place in Paris, France. Paris was also the first Olympic Games where women were allowed to compete. After the initial success, the Olympics struggled. The celebrations in Paris (1900) and St. Louis (1904) were overshadowed by the world's fair exhibitions in which they were included. The so-called Intercalated Games (because of their off-year status, as 1906 is not divisible by four) were held in 1906 in Athens, as the first of an alternating series of Athens-held Olympics. Although originally the IOC recognised and supported these games, they are currently not recognised by the IOC as Olympic Games, which has given rise to the explanation that they were intended to mark the 10th anniversary of the modern Olympics. The 1906 Games again attracted a broad international field of participants—in 1904, 80% had been American—--and great public interest, thereby marking the beginning of a rise in popularity and size of the Games. From the 241 participants from 14 nations in 1896, the Games grew to nearly 11,100 competitors from 202 countries at the 2004 Summer Olympics in Athens. The number of competitors at the Winter Olympics is much smaller than at the Summer Games; at the 2006 Winter Olympics in Turin Italy, 2,633 athletes from 80 countries competed in 84 events. The Olympics are one of the largest media events. In Sydney in 2000 there were over 16,000 broadcasters and journalists, and an estimated 3.8 billion viewers watched the games on television. The growth of the Olympics is one of the largest problems the Olympics face today. Although allowing professional athletes and attracting sponsorships from major international companies solved financial problems in the 1980s, the large number of athletes, media and spectators makes it difficult and expensive for host cities to organize the Olympics. 203 countries currently participate in the Olympics. This is a noticeably higher number than the number of countries recognised by the United Nations, which is only 193. The International Olympic Committee allows nations to compete which do not meet the strict requirements for political sovereignty that many other international organizations demand. As a result, many colonies and dependencies are permitted to host their own Olympic teams and athletes even if such competitors hold the same citizenship as another member nation. Examples of this include territories such as Puerto Rico, Bermuda, and Hong Kong, all of which compete as separate nations despite being legally a part of another country. Also, since 1980, Taiwan has competed under the name " Chinese Taipei", and under a flag specially prepared by the IOC. Prior to that year the People's Republic of China refused to participate in the Games because Taiwan had been competing under the name "Republic of China". The Republic of the Marshall Islands was recognised as a nation by the IOC on February 9, 2006, and should compete in the 2008 Summer Olympics in Beijing. The 1956 Melbourne Olympics were boycotted by the Netherlands, Spain, and Switzerland, because of the repression of the Hungarian Uprising by the Soviet Union; additionally, Cambodia, Egypt, Iraq, and Lebanon, boycotted the games due to the Suez Crisis. In 1972 and 1976, a large number of African countries threatened the IOC with a boycott, to force them to ban South Africa, Rhodesia, and New Zealand. The IOC conceded in the first 2 cases, but refused in 1976 because the boycott was prompted by a New Zealand rugby union tour to South Africa, and rugby was not an Olympic sport. The countries withdrew their teams after the games had started; some African athletes had already competed. A lot of sympathy was felt for the athletes forced by their governments to leave the Olympic Village; there was little sympathy outside Africa for the governments' attitude. Twenty-two countries (Guyana was the only non-African nation) boycotted the Montreal Olympics because New Zealand was not banned. Also in 1976, due to pressure from the People's Republic of China (PRC), Canada told the team from the Republic of China (Taiwan) that it could not compete at the Montreal Summer Olympics under the name "Republic of China" despite a compromise that would have allowed Taiwan to use the ROC flag and anthem. Taiwan refused and as a result did not participate until 1984, when it returned under the name " Chinese Taipei" and used a special flag. In 1980 and 1984, the Cold War opponents boycotted each other's games. The United States led and 64 other Western nations followed in refusing to compete at the Moscow Olympics in 1980 because of the Soviet invasion of Afghanistan, but 16 other Western nations did compete at the Moscow Olympics. The boycott reduced the number of nations participating to only 80. This is the lowest number of nations to compete since 1956. The Soviet Union and 14 of its Eastern Bloc partners (except Romania) countered by skipping the Los Angeles Olympics in 1984, arguing the safety of their athletes could not be guaranteed there and "chauvinistic sentiments and an anti-Soviet hysteria are being whipped up in the United States". The 1984 boycotters staged their own Friendship Games in July-August. One of the main problems facing the Olympics (and international sports in general) is doping, or performance enhancing drugs. In the early 20th century, many Olympic athletes began using drugs to enhance their performance. 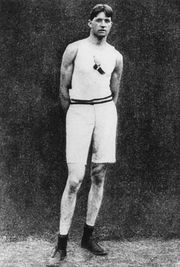 For example, the winner of the marathon at the 1904 Games, Thomas J. Hicks, was given strychnine and brandy by his coach, even during the race. As these methods became more extreme, gradually the awareness grew that this was no longer a matter of health through sports. In the mid-1960s, sports federations put a ban on doping, and the IOC followed suit in 1967. The first and so far only Olympic death caused by doping occurred in 1960. At the cycling road race in Rome the Danish Knut Enemark Jensen fell from his bicycle and later died. A coronor's inquiry found that he was under the influence of amphetamines. The first Olympic athlete to test positive for doping use was Hans-Gunnar Liljenwall, a Swedish pentathlete at the 1968 Summer Olympics, who lost his bronze medal for alcohol use. Seventy-three athletes followed him over the next 38 years, several medal winners among them. The most publicised doping-related disqualification was that of Canadian sprinter Ben Johnson, who won the 100m at the 1988 Seoul Olympics, but tested positive for stanozolol. Despite the testing, many athletes continued to use doping without getting caught. In 1990, documents were revealed that showed many East German female athletes had been unknowingly administered anabolic steroids and other drugs by their coaches and trainers as a government policy. In the late 1990s, the IOC took initiative in a more organised battle against doping, leading to the formation of the World Anti-Doping Agency (WADA) in 1999. The recent 2000 Summer Olympics and 2002 Winter Olympics have shown that this battle is not nearly over, as several medalists in weightlifting and cross-country skiing were disqualified due to doping offences. Most recently, during the 2006 Winter Olympics, only one athlete failed a drug test and had a medal revoked. The only other case involved 12 members with high levels of haemoglobin and their punishment was a five day suspension for health reasons. The International Olympic Committee introduced blood testing for the first time during these games. Politics interfered with the Olympics on several occasions, the most well-known of which was the 1936 Summer Olympics in Berlin, where the games were used as propaganda by the German Nazis. At this Olympics, a true Olympic spirit was shown by Luz Long, who helped Jesse Owens (a black athlete) to win the long jump, at the expense of his own silver medal. The Soviet Union did not participate in the Olympic Games until the 1952 Summer Olympics in Helsinki. Instead, the Soviets organized an international sports event called Spartakiads, from 1928 onward. Many athletes from associations organized by Communists or close to them chose not to participate or were even barred from participating in Olympic Games, and instead participated in Spartakiads. A political incident on a smaller scale occurred at the 1968 Summer Olympics in Mexico City. Two American track-and-field athletes, Tommie Smith and John Carlos, performed the Black Power salute on the victory stand of the 200-meter track and field race. In response, the IOC's autocratic president Avery Brundage told the USOC to either send the two athletes home, or withdraw the complete track and field team. The USOC opted for the former. In a political policy move that flouts the spirit of the Olympic movement, the government of the Islamic Republic of Iran specifically orders its athletes not to compete in any olympic heat, semi-final, or final that includes athletes from Israel. At the 2004 Olympics, an Iranian judo wrestler refused to compete in a heat against an Israeli judo wrestler, but did so in a way that 'covered' the possibility of Iran being removed from the games for political intrigue (the athlete deliberately overweighted himself out of his class). This athlete returned home to a heroes welcome. Despite what Coubertin had hoped for, the Olympics did not bring total peace to the world. In fact, three Olympiads had to pass without Olympics because of war: due to World War I the 1916 Games were canceled, and the summer and winter games of 1940 and 1944 were canceled because of World War II. Terrorism has also become a recent threat to the Olympic Games. In 1972, when the Summer Games were held in Munich, West Germany, eleven members of the Israeli Olympic team were taken hostage by Palestinian terrorist group Black September in what is known as the Munich massacre. A bungled liberation attempt led to the deaths of the nine abducted athletes who had not been killed prior to the rescue as well as that of a policeman, with five of the terrorists also being killed. During the Summer Olympics in 1996 in Atlanta, a bombing at the Centennial Olympic Park killed two and injured 111 others. The bomb was set by Eric Robert Rudolph, an American domestic terrorist, who is currently serving a life sentence at Supermax in Florence, Colorado. The 2002 Winter Olympics in Salt Lake City were the first Olympic Games since the September 11, 2001 attacks. Olympic Games since then have required an extremely high degree of security due to the fear of possible terrorist activities. A number of organizations are involved in organizing the Olympic Games. Together they form the Olympic Movement. The rules and guidelines by which these organizations operate are outlined in the Olympic Charter. At the heart of the Olympic Movement is the International Olympic Committee (IOC), currently headed by Jacques Rogge. It can be seen as the government of the Olympics, as it takes care of the daily problems and makes all important decisions, such as choosing the host city of the Games, and the programme of the Olympics. Organising Committees for the Olympic Games (OCOGs), which take care of the organisation of a specific celebration of the Olympics. At present, 202 NOCs and 35 IFs are part of the Olympic Movement. OCOGs are dissolved after the celebration of each Games, once all subsequent paperwork has been completed. More broadly speaking, the term Olympic Movement is sometimes also meant to include everybody and everything involved in the Olympics, such as national sport governing bodies, athletes, media, and sponsors of the Olympic Games. Most Olympic Games have been held in European and North American cities; only a few games have been held in other places, which were still limited to eastern Asian cities. All bids by countries in South America and Africa have failed. Many non-westerners believe the games should expand to include locations in poorer regions. Economists point out that the massive infrastructure investments could springboard cities into earning higher GDP after the games. In the past, the IOC has often been criticised for being a monolithic organisation, with several members remaining a member at old age, or even until their deaths. The leadership of IOC president Juan Antonio Samaranch especially has been strongly criticised. Under his presidency, the Olympic Movement made great progress, but has been seen as autocratic and corrupt. Samaranch's ties with the former fascist government in Spain, and his long term as a president (21 years)—until he was 81 years old—have also been points of critique. In 1998, it became known that several IOC members had taken bribes from the organising committee for the 2002 Winter Olympics in Salt Lake City, Utah, in exchange for a vote on the city at the election of the host city. The IOC started an investigation, which led to four members resigning and six being expelled. The scandal set off further reforms, changing the way in which host cities are elected to avoid further bribes. Also, more active and former athletes were allowed in the IOC, and the membership terms have been limited. The same year (1998), four European groups organized the International Network Against Olympic Games and Commercial Sports to oppose their cities' bids for future Olympic Games. Also, an Anti-Olympic Alliance had formed in Sydney to protest the hosting of the 2000 Games. Later, a similar movement in Vancouver and Whistler, British Columbia organized to protest the hosting of the 2010 Winter Games. These movements were particularly concerned about adverse local economic impact and dislocation of people to accommodate the hosting of the Olympics. A BBC documentary aired in August 2004, entitled Panorama: "Buying the Games", investigated the taking of bribes in the bidding process for the 2012 Summer Olympics. The documentary claimed it is possible to bribe IOC members into voting for a particular candidate city. In particular, Bulgaria's member Ivan Slavkov, and Muttaleb Ahmad from the Olympic Council of Asia, were implicated. They have denied the allegations. Others have alleged that the 2006 Winter Olympics were held in Turin because officials bribed the IOC and so Turin got the games and Sion, Switzerland (which was the favorite) did not. The Olympic Movement has been accused of being overprotective of its symbolism (in particular, it claims an exclusive and monopolistic copyright over any arrangement of five rings and the term "olympics"), and have taken action against things unrelated to sport, such as the role-playing game Legend of the Five Rings. It was accused of homophobia in 1982 when it successfully sued the Gay Olympics, an event now know as the Gay Games, to bar it from using the term "olympics" in its name. The Olympic movement uses many symbols, most of them representing Coubertin's ideas and ideals. The best known symbol is probably that of the Olympic Rings. These five intertwined rings represent the unity of five continents (the Americas are considered one continent). They appear in five colors on a white field on the Olympic Flag. These colors, white (for the field), red, blue, green, yellow, and black were chosen such that each nation had at least one of these colors in its national flag. The flag was adopted in 1914, but the first Games at which it was flown were Antwerp, 1920. It is hoisted at each celebration of the Games. "The most important thing in the Olympic Games is not to win but to take part, just as the most important thing in life is not the triumph but the struggle. The essential thing is not to have conquered but to have fought well." The Olympic Flame is lit in Olympia and brought to the host city by runners carrying the torch in relay. There it plays an important role in the opening ceremonies. Though the torch fire has been around since 1928, the relay was introduced in 1936. The Olympic mascot, an animal or human figure representing the cultural heritage of the host country, was introduced in 1968. It has played an important part of the games since 1980 with the debut of misha, a Russian bear. French and English are the two official languages of the Olympic movement. Opening ceremonies climax with the lighting of the Olympic Flame. For lighting the torch, modern games feature elaborate mechanisms such as this cauldron-spiral-cauldron arrangement lit by the 1980 U.S. Olympic ice hockey team at the 2002 Winter Olympics. Apart from the traditional elements, the host nation ordinarily presents artistic displays of dance and theatre representative of that country. Various traditional elements frame the opening ceremonies of a celebration of the Olympic Games. The ceremonies typically start with the hoisting of the host country's flag and the performing of its national anthem. The traditional part of the ceremonies starts with a "parade of nations" (or of athletes), during which most participating athletes march into the stadium, country by country. One honored athlete, typically a top competitor, from each country carries the flag of his or her nation, leading the entourage of other athletes from that country. Traditionally (starting at the 1928 Summer Olympics) Greece marches first, because of its historical status as the origin of the Olympics, while the host nation marches last. (Exceptionally, in 2004, when the Games were held in Athens, Greece marched last as host nation rather than first, although the flag of Greece was carried in first.) Between these two nations, all other participating nations march in alphabetical order of the dominant language of the host country, or in French or English alphabetical order if the host country does not write its dominant language in an alphabet which has a set order. In the 1992 Summer Olympics in Barcelona, both Spanish and Catalan were official languages of the games, but due to politics surrounding the use of Catalan, the nations entered in French alphabetical order. The XVIII Olympic Winter Games in Nagano, Japan saw nations entering in English alphabetical order since the Japanese language grouped both China and Chinese Taipei together in the Parade of Nations. In some cases, the country's head of state did not open the Olympics. Three examples of this are from the United States. First, in 1932, when Vice-President Charles Curtis opened the Games of the Xth Olympiad in Los Angeles, California, then New York Governor Franklin D. Roosevelt opened the III Olympic Winter Games in Lake Placid, New York instead of President Herbert Hoover, then, in 1960, when Vice-President Richard Nixon opened the VIII Olympic Winter Games in Squaw Valley, California instead of President Dwight Eisenhower, and finally, in 1980, when Vice President Walter Mondale, not President Jimmy Carter, opened the XIII Olympic Winter Games, also in Lake Placid. Despite this, the Games are awarded to a city, not to the country. At the 2000 Sydney Games, Australian Governor-General Sir William Deane opened the Games, as Queen Elizabeth (who as Queen of Australia is the Australian head of state) did not attend. Next, the Olympic Flag is carried horizontally (since the 1960 Summer Olympics) into the stadium and hoisted as the Olympic Anthem is played. The flag bearers of all countries circle a rostrum, where one athlete (since the 1920 Summer Olympics) and one judge (since the 1972 Summer Olympics) speak the Olympic Oath, declaring they will compete and judge according to the rules. Finally, the Torch is brought into the stadium, passed from athlete to athlete, until it reaches the last carrier of the Torch, often a well-known athlete from the host nation, who lights the fire in the stadium's cauldron. The Olympic Flame has been lit since the 1928 Summer Olympics, but the torch relay did not start until the 1936 Summer Olympics. Beginning at the post-World War I 1920 Summer Olympics, the lighting of the Olympic Flame was for 68 years followed by the release of doves, symbolizing peace. This gesture was discontinued after several doves were burned alive in the Olympic Flame during the opening ceremony of the 1988 Summer Olympics. However, some Opening Ceremonies have continued to include doves in other forms; for example, the 2002 Winter Olympics featured skaters holding kite-like cloth dove puppets. Opening ceremonies have been held outdoors, usually on the main athletics stadium, but those for the 2010 Winter Olympics will be the first to be held indoors, at the BC Place Stadium. Various traditional elements also frame the closing ceremonies of an Olympic Games, which take place after all of the events have concluded. Flag bearers from each participating delegation enter the stadium in single file, but behind them march all of the athletes without any distinction or grouping of nationality. This tradition began at the 1956 Summer Olympics at the suggestion of Melbourne schoolboy John Ian Wing, who thought it would be a way of bringing the athletes of the world together as "one nation". (In 2006, the athletes marched in with their countrymen, then dispersed and mingled as the ceremonies went on). The Antwerp flag: Was presented to the IOC at the 1920 Summer Olympics by the city of Antwerp, Belgium, and was passed on to the next organising city of the Summer Olympics until the Games of Seoul 1988. The Oslo flag: Was presented to the IOC at the 1952 Winter Olympics by the city of Oslo, Norway, and is passed on to the next organising city of the Winter Olympics. The Seoul flag: Was presented to the IOC at the 1988 Summer Olympics by the city of Seoul, South Korea, and is passed on to the next organising city of the Summer Olympics, which was Barcelona, Spain, at that time. After these traditional elements, the next host nation introduces itself with artistic displays of dance and theatre representative of that country. This tradition began with the 1976 Games. The Olympic Flame is extinguished, and while the Olympic anthem is being played, the Olympic Flag that was hoisted during the opening ceremonies is lowered from the flagpole and horizontally carried out of the stadium. Currently, the Olympic program consists of 35 different sports, 53 disciplines and more than 400 events. The Summer Olympics includes 28 sports with 38 disciplines and the Winter Olympics includes 7 sports with 15 disciplines. Nine sports were on the original Olympic programme in 1896: athletics, cycling, fencing, gymnastics, weightlifting, shooting, swimming, tennis, and wrestling. If the 1896 rowing events had not been cancelled due to bad weather, they would have been included in this list as well. At the most recent Winter Olympics, seven sports were conducted, or 15 if each sport such as skiing and skating is counted. Of these, cross country skiing, figure skating, ice hockey, Nordic combined, ski jumping, and speed skating have been featured on the programme at all Winter Olympics. In addition, figure skating and ice hockey also have been contested as part of the Summer Games before the introduction of separate Winter Olympics. In recent years, the IOC has added several new sports to the programme to attract attention from young spectators. Examples of such sports include snowboarding and beach volleyball. The growth of the Olympics also means that some less popular ( modern pentathlon) or expensive (white water canoeing) sports may lose their place on the Olympic programme. The IOC decided to discontinue baseball and softball beginning in 2012. Rule 48.1 of the Olympic Charter requires that there be a minimum of 15 Olympic sports at each Summer Games. Following its 114th Session (Mexico 2002), the IOC also decided to limit the programme of the Summer Games to a maximum of 28 sports, 301 events, and 10,500 athletes. The Olympic sports are defined as those governed by the International Federations listed in Rule 46 of the Olympic Charter. A two-thirds vote of the IOC is required to amend the Charter to promote a Recognised Federation to Olympic status and therefore make the sports it governs eligible for inclusion on the Olympic programme. Rule 47 of the Charter requires that only Olympic sports may be included in the programme. The IOC reviews the Olympic programme at the first Session following each Olympiad. A simple majority is required for an Olympic sport to be included in the Olympic programme. Under the current rules, an Olympic sport not selected for inclusion in a particular Games remains an Olympic sport and may be included again later with a simple majority. At the 117th IOC Session, 26 sports were included in the programme for London 2012. Until 1992, the Olympics also often featured demonstration sports. The objective was for these sports to reach a larger audience; the winners of these events are not official Olympic champions. These sports were sometimes sports popular only in the host nation, but internationally known sports have also been demonstrated. Some demonstration sports eventually were included as full-medal events. The English public schools of the second half of the 19th century had a major influence on many sports. The schools contributed to the rules and influenced the governing bodies of those sports out of all proportion to their size. They subscribed to the Ancient Greek and Roman belief that sport formed an important part of education, an attitude summed up in the saying: mens sana in corpore sano – a sound mind in a healthy body. In this ethos, taking part has more importance than winning, because society expected gentlemen to become all-rounders and not the best at everything. Class prejudice against "trade" reinforced this attitude. The house of the parents of a typical public schoolboy would have a tradesman's entrance, because tradesmen did not rank as the social equals of gentlemen. Apart from class considerations there was the typically English concept of "fairness," in which practicing or training was considered as tantamount to cheating; it meant that you considered it more important to win than to take part. Those who practiced a sport professionally were considered to have an unfair advantage over those who practiced it merely as a "hobby." The public schools had a deep involvement in the development of many team sports including all British codes of football as well as cricket and hockey. The ethos of English public schools greatly influenced Pierre de Coubertin. The International Olympic Committee invited a representative of the Headmasters' Conference (the association of headmasters of the English public schools) to attend their early meetings. The Headmasters' Conference chose the Reverend Robert Laffan, the headmaster of Cheltenham College, as their representative to the IOC meetings. He was made a member of the IOC in 1897 and, following the first visit of the IOC to London in 1904, he was central to the founding of the British Olympic Association a year later. In Coubertin's vision, athletes should be gentlemen. Initially, only amateurs were considered such; professional athletes were not allowed to compete in the Olympic Games. A short-lived exception was made for professional fencing instructors. This exclusion of professionals has caused several controversies throughout the history of the modern Olympics. 1912 Olympic pentathlon and decathlon champion, Jim Thorpe, was disqualified when it was discovered that he played semi-professional baseball prior to winning his medals. He was restored as champion on compassionate grounds by the IOC in 1983. Swiss and Austrian skiers boycotted the 1936 Winter Olympics in support of their skiing teachers, who were not allowed to compete because they earned money with their sport and were considered professionals. It gradually became clear to many that the amateurism rules had become outdated, not least because the self-financed amateurs of Western countries often were no match for the state-sponsored "full-time amateurs" of Eastern bloc countries. Nevertheless, the IOC held to the traditional rules regarding amateurism. In the 1970s, amateurism requirements were dropped from the Olympic Charter, leaving decisions on professional participation to the international federation for each sport. This switch was perhaps best exemplified by the American Dream Team, composed of well-paid NBA stars, which won the Olympic gold medal in basketball in 1992. As of 2004, the only sport in which no professionals compete is boxing (though even this requires a loose definition of amateurism, as some boxers receive cash prizes from their NOCs); in men's football (soccer), the number of players over 23 years of age is limited to three per team. Advertisement regulations are still very strict, at least on the actual playing field, although "Official Olympic Sponsors" are common. Athletes are only allowed to have the names of clothing and equipment manufacturers on their outfits. The sizes of these markings are limited. With 10 Olympic titles including those from Intercalated games, Ray Ewry may be considered one of the most successful Olympic athletes in the history of the modern Olympics. The athletes (or teams) who place first, second, or third in each event receive medals. The winners receive "gold medals". (Though they were solid gold until 1912, they are now made of gilded silver.) The runners-up receive silver medals, and the third-place athletes bronze medals. In some events contested by a single-elimination tournament (most notably boxing), third place might not be determined, in which case both semi-final losers receive bronze medals. The practice of awarding medals to the top three competitors was introduced in 1904; at the 1896 Olympics only the first two received a medal, silver and bronze, while various prizes were awarded in 1900. However, the 1904 Olympics also awarded silver trophies for first place, which makes Athens 1906 the first games that awarded the three medals only. In addition, from 1948 onward athletes placing fourth, fifth and sixth have received certificates which became officially known as "victory diplomas;" since 1976 the medal winners have received these also, and in 1984 victory diplomas for seventh- and eighth-place finishers were added, presumably to ensure that all losing quarter-finalists in events using single-elimination formats would receive diplomas, thus obviating the need for consolation (or officially, "classification") matches to determine fifth through eighth places (though interestingly these latter are still contested in many elimination events anyway). Certificates were awarded also at the 1896 Olympics, but there they were awarded in addition to the medals to first and second place. Commemorative medals and diplomas — which differ in design from those referred to above — are also made available to participants finishing lower than third and eighth respectively. At the 2004 Summer Olympics in Athens, the first three were given wreaths as well as their medals. Because the Olympics are held only once every four years, the public and athletes often consider them as more important and valuable than world championships and other international tournaments, which are often held annually. Many athletes have become celebrities or heroes in their own country, or even world-wide, after becoming Olympic champions. The diversity of the sports, and the great differences between the Olympic Games in 1896 and today make it difficult to decide which athlete is the most successful Olympic athlete of all time. This is further complicated since the IOC no longer recognises the Intercalated Games which it originally organised. When measuring by the number of titles won at the Modern Olympic Games, the following athletes may be considered the most successful (2 golds from the Intercalated Games are included in Ray Ewry's scores). By 2010, the Olympic Games will have been hosted by 41 cities in 22 countries. In 2012, London will become the first city to have hosted the Olympic Games three times. The number in parentheses following the city/country denotes how many times that city/country had then hosted the games. 4 Equestrian events were held in Stockholm, Sweden. 5 Equestrian events will be held in Hong Kong.